Postage rate changes which take effect from 3 April will require several new stamps. The basic 1st & 2nd class rates will each rise by 2p, to 32p & 23p respectively. There will be no 32p or 23p stamps as these are satisfied by the 1st class gold and 2nd class blue. There is no need for a 'balancing' 9p as that already exists. The 60-100gr rates will rise from 46p (1st) to 49p, and from 35p (2nd) to 37p, so that two new stamps will be issued. The 100gr 2nd class stamp was only introduced in April 2005 at 35p and has one phosphor band, so we can expect the new 37p to have one band also. Basic Europe rate 10gr and postcards: +2p to 44p - new Machin and Country stamps to replace 42p (existing 'E' rate stamps bought for 38/40/42p still valid). Basic Worldwide rate 10gr and postcards: +3p to 50p - the existing 50p stamp will replace the 47p. Worldwide 20gr rate: +4p to 72p, new 72p Machin and Country stamps will be issued. Worldwide 40gr rate: +7p to £1.12/£1.19 (zone 1/2). 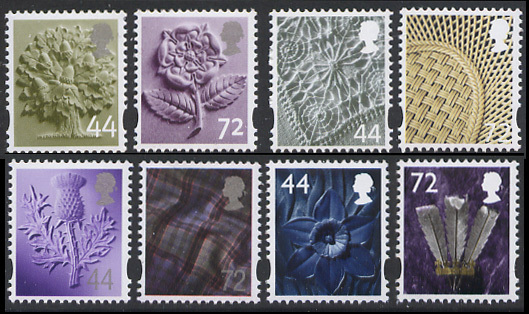 This should also be satisfied by the airmail NVI, but special stamps will be £1.19 instead of £1.12. All the stamps will be printed by De La Rue in gravure except the Northern Ireland stamps which will be litho. Norvic Philatelics will service Post Office first day covers for these stamps. Mint stamps: Set of 4 Machins - £2.75, country stamps £1.50 per country. Postage and packing is extra in all cases.